TfL has launched a consultation about reducing various bus services. 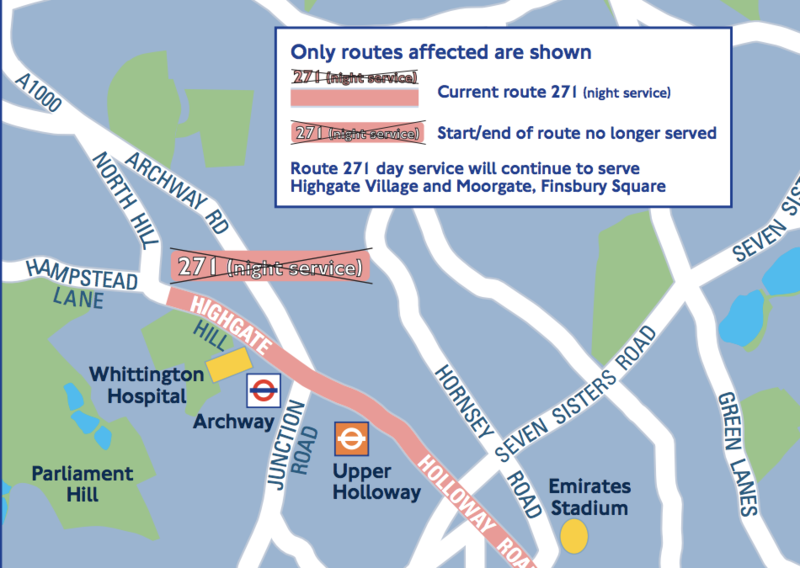 The bit that affects Highgate is the proposal to withdraw the 271 night service on all nights. The Forum would like to hear your views and would encourage anyone with strong views to respond directly. The 271 night service currently runs every day from midnight to 5.30am. TfL says that usage on the route has fallen following the opening of Night Tube at weekends, and has also fallen on weekdays. This is part of a wider TfL consultation about cuts in bus services and comes as no surprise given the financial constraints the organisation is under. The closing date for comments is Friday 9 November. I have to admit that I have only ever used the night service once, and that was about ten years ago. However I remain impressed by the fact it exists. TfL figures purport to show that very few people use the bus but as they only require people to tap in, and not out, I cannot see how they can know how many people are still on the bus by the time it reaches The Whittington and Highgate Village. Furthermore they take no account of the fact that you have to walk up a steep hill to get there. Do not stop the night service. It provides a useful and safer way to get to Highgate. I think it would be a very bad move to curtail the 271 night service as planned. It’s a long walk up to the Village (and beyond) from Archway or Highgate Tube Stations. What about bar and restaurant staff having to get home after their late shifts ? Have you all commented on the TFL consultation site? – see link above. Interesting for us to hear from you but it’s TfL you need to reach! Instead of cutting the service short, I think it is more useful to route it to via Euston station to Russell Square / British Museum area, maintaining Highgate’s bus connection to the museum. theatre and shopping districts.